I was thrilled when my brother-in-law first told us he was purchasing a ring! It isn't every day you add a sister-in-law to the mix, especially one that you really like! I know I take it for granted that I currently have three sisters-in-law and am blessed to call them all friends. Now I look forward to adding one more awesome lady to the family. Kyle, thanks for picking a good one! We had high expectations and you delivered. 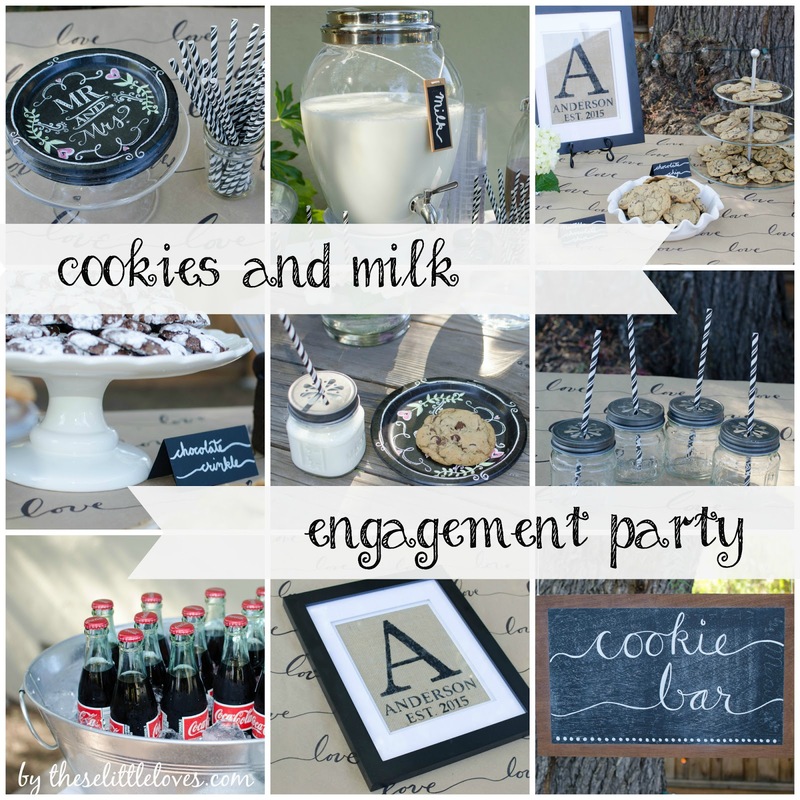 True to my love of planning parties, I decided that I wanted to throw the happy couple an engagement party. With the abundance of celebrations I threw last year - seriously, people, stop having babies - I figured I needed to go super low-key for the engagement party. I almost succeeded in that, but my excitement got the better of me and I added a little DIY fun to make it a little more personal and special. The second inspiration for the party design was the engagement gift I had planned for the happy couple. 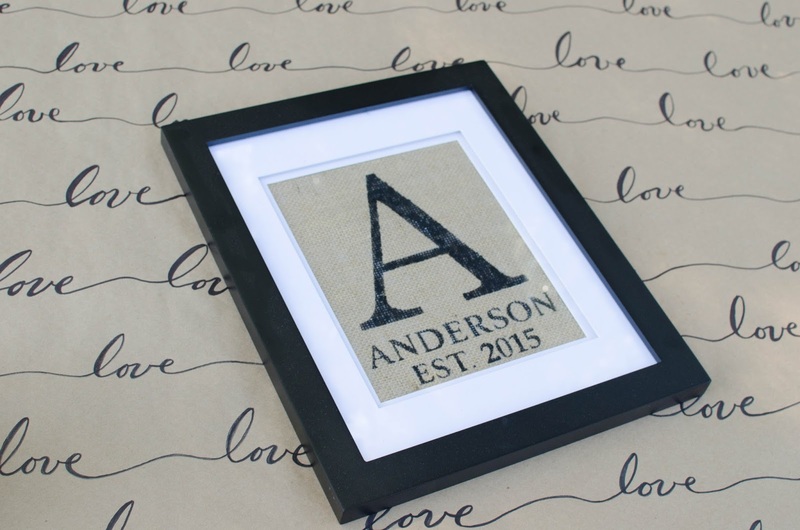 It has become somewhat of a tradition that I give every couple in our family burlap monogram art commemorating the year of their marriage. A simple handmade gift that also happens to work perfectly as a party decoration. The other decorations grew from there. I added some rustic elements (natural wood, burlap), simple white flowers, patterned straws in mason jar sippers, a hand-drawn 'calligraphy' table runner, and topped it off with a few chalkboard details. I can't quite put my finger on a name for the style of this party. A throw-back to elementary school days, yet all grown up. We had six types of cookies in all: browned butter chocolate chip (w/ and w/out nutella), browned butter snickerdoodles (w/ and w/out caramel), chocolate crinkle, and peanut butter. 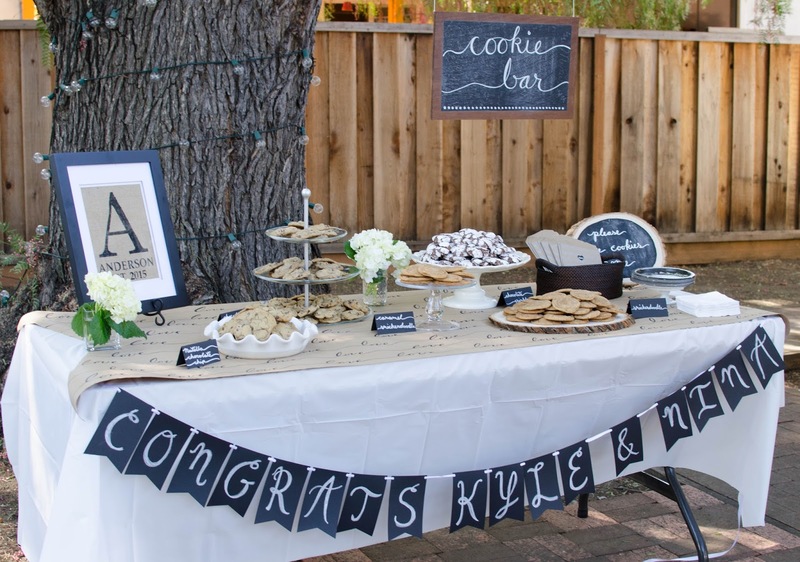 To add variety to the cookie display I pulled out my cake stands, cookie stands, pie plates, and even a wood slice to use as serving dishes. 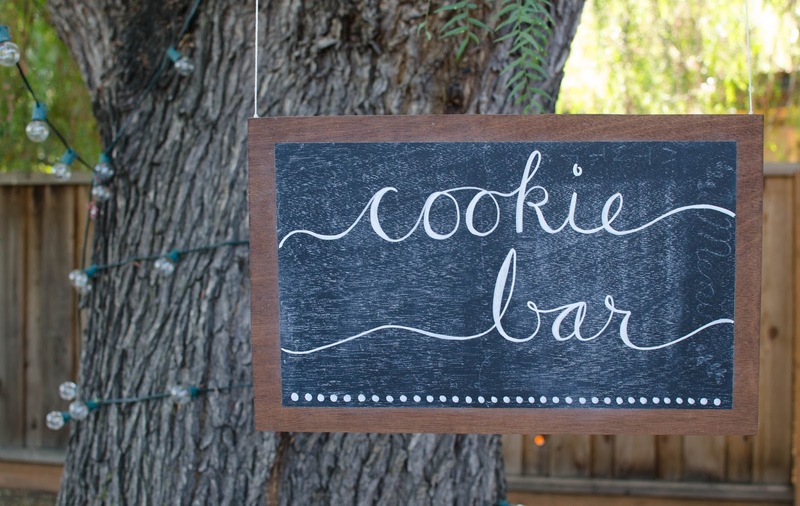 My husband was a great sport and rigged up a way to hang my kitchen menu chalkboard from a tree to provide the 'Cookie Bar' sign. The milk table turned out just as cute. White milk, chocolate milk, glass-bottled Coke (the yummy Mexican kind), and water rounded out the beverage options. I was a little hesitant at first to put milk in large drink dispensers outside. Even with the table in the shade I wanted a little extra 'insurance' against the milk going warm and gross. The solution was to put reusable Plastic Ice Cubes into each drink dispenser. 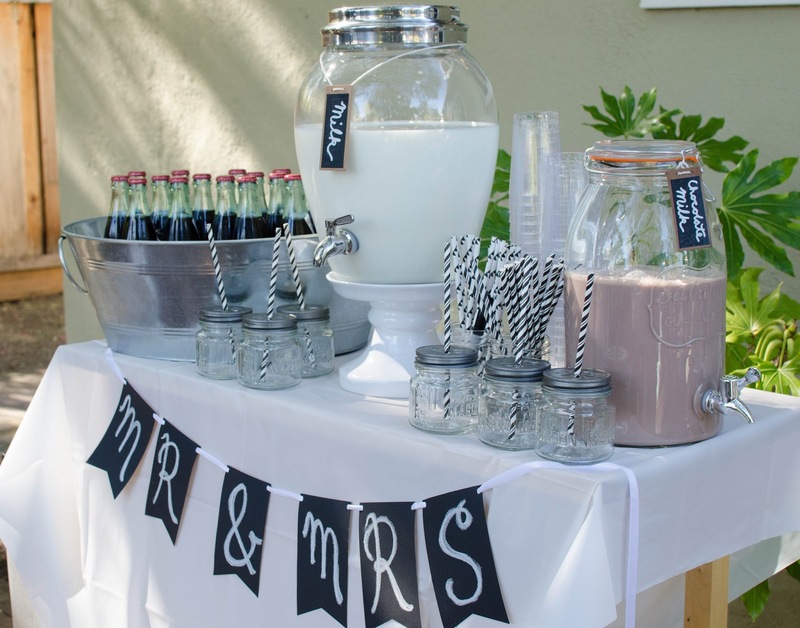 It kept the milk perfectly cool the entire length of the party and didn't dilute the drink like normal ice cubes. 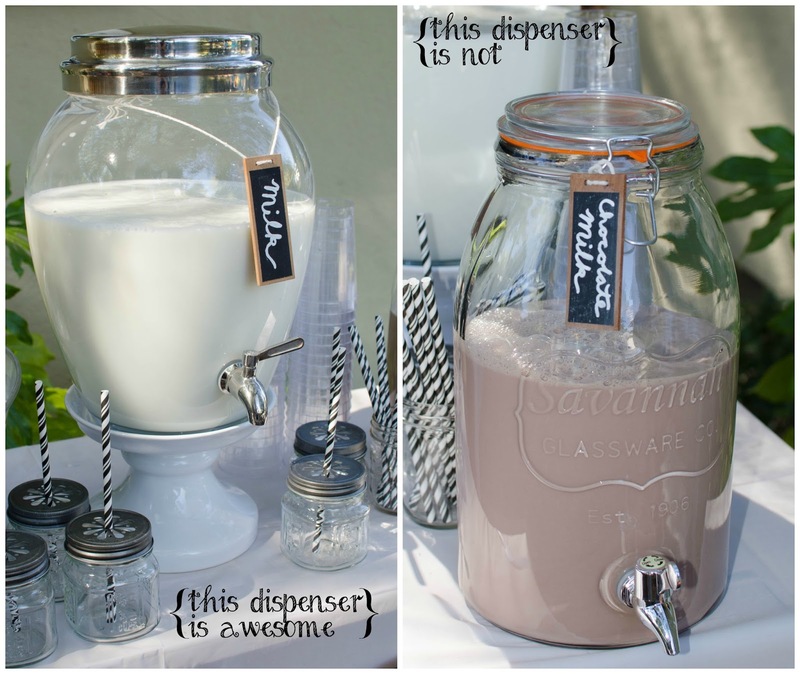 For cups, I debuted the Mason Jar Sippers purchased with a 'thank you' gift card from planning the safari themed baby shower last year. 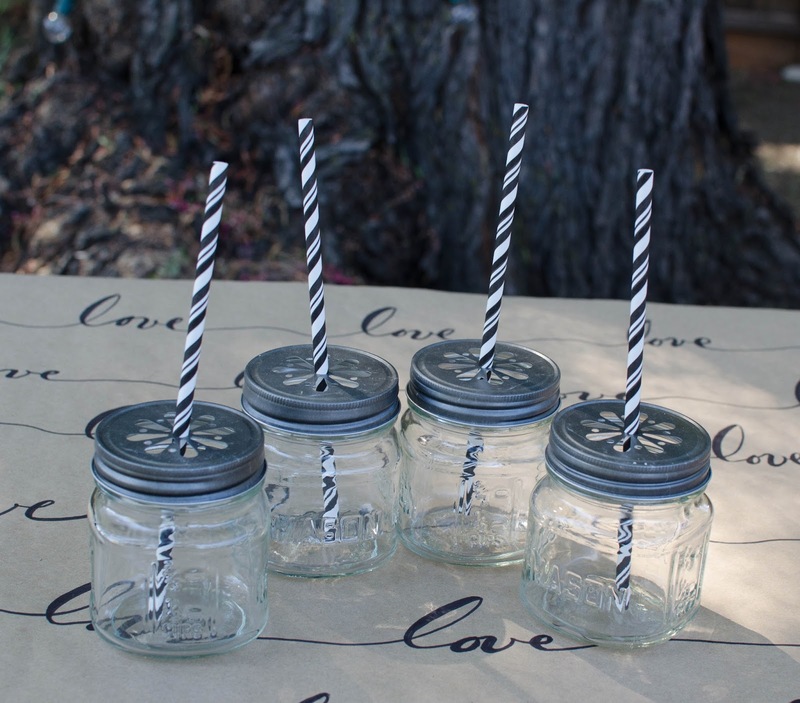 I bought these as a set, but you can also turn regular mason jars into drinks with mason jar daisy straw lids. 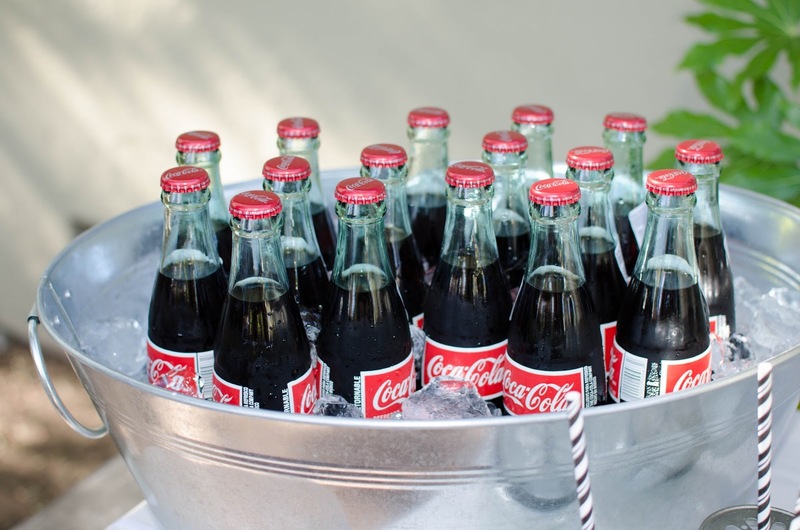 The Cokes kept cool in a galvanized metal drink tub I purchased years ago for my wedding. In addition to the large 'Cookie Bar' chalkboard, we had a few other chalkboard touches. 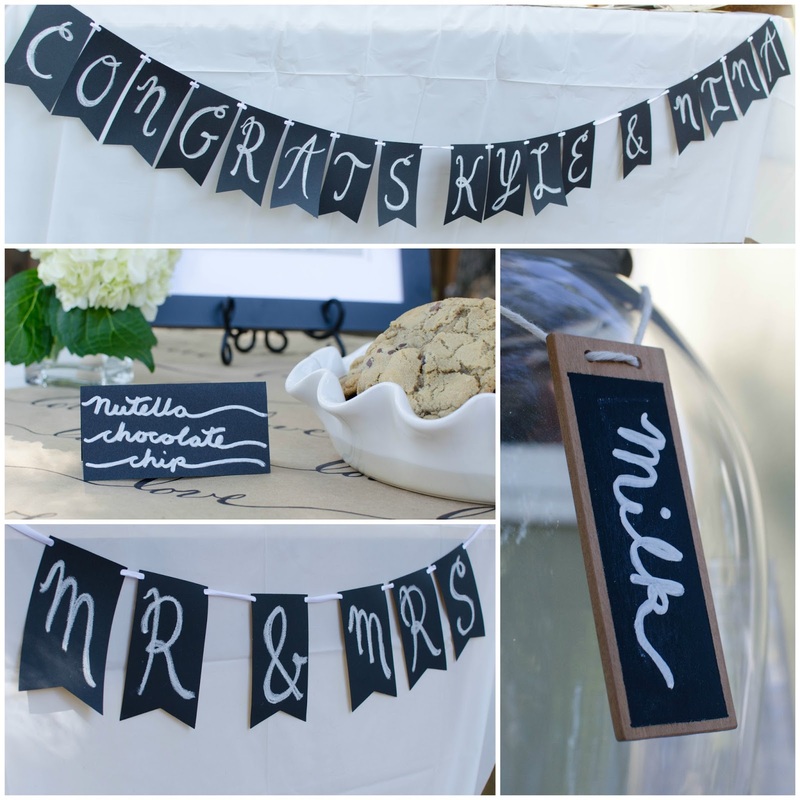 The banners were actually 'faux' chalkboard, which is just a fancy way to say that I cut black cardstock paper into pennants and then wrote on them using my son's white sidewalk chalk. You have to be careful not to smudge it before the party, but it works great! 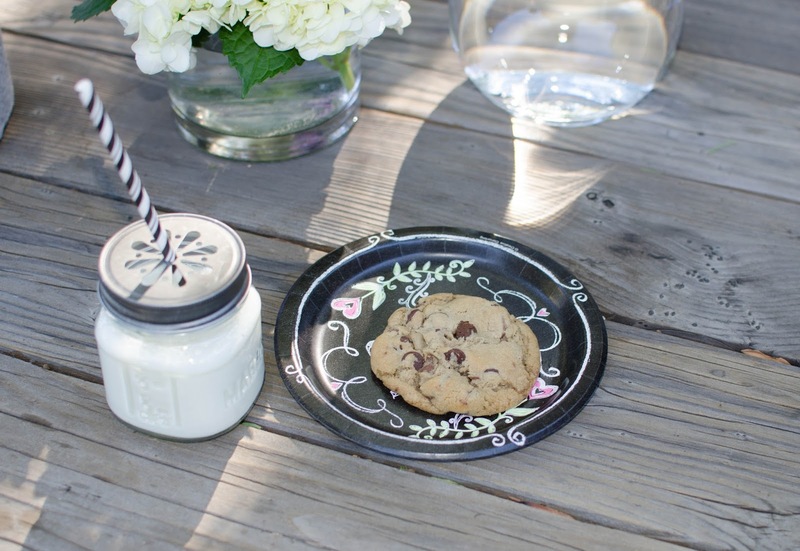 The cookie labels were also created using black paper and a chalk marker. My drink dispenser tags were a gift made by my husband (he's a keeper!) and are pretty much a staple at all my parties. I couldn't bear to get rid of this paper after the party so it is currently sitting in my garage waiting to be used as gift wrap. See what a great background the runner provides for the setup! 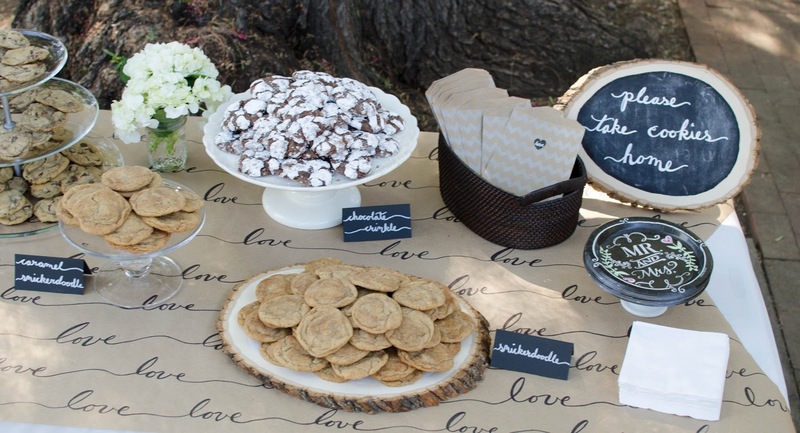 And a perfect reminder of what the party is all about...cookies, I mean, love! And now for my favorite part of the party - the dessert plates! I generally get a little too excited about party supplies, so when partypail.com offered to let me try some of their products (no strings attached) I may or may not have flipped out (in a good way). You know that giddy feeling when you have a party idea in your head and then you find something that fits the picture in your head perfectly? Hmm, just me? 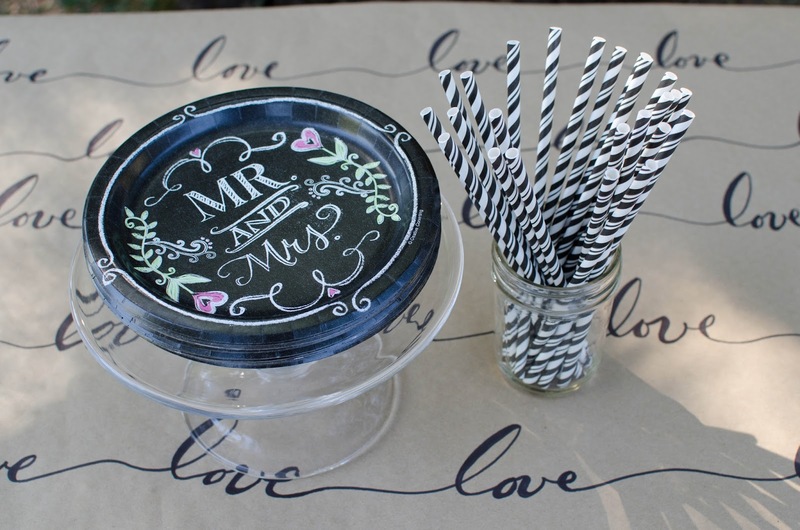 Well, it was love at first sight with these chalkboard Mr and Mrs Plates from partypail. Like I said, I get a wee bit excited about party supplies (and office supplies...maybe supplies in general?) It turns out it is a little difficult to decorate a party in all black and white and have it look festive. 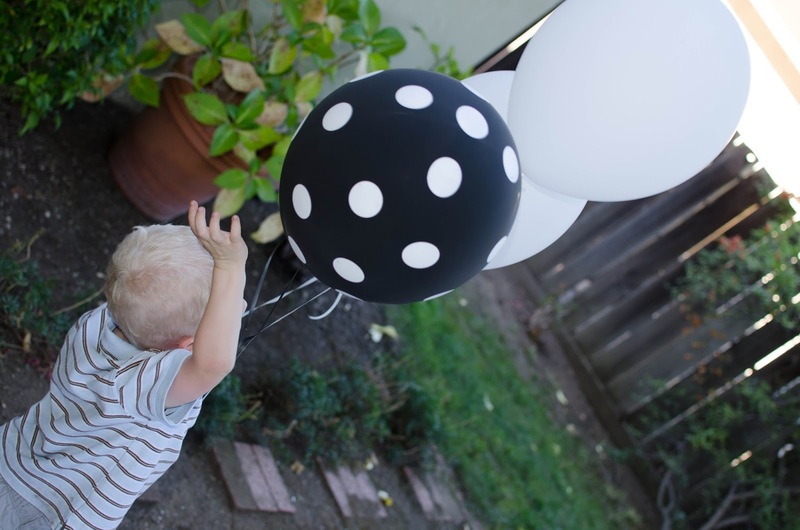 The touch of color on the plates and the black and white striped straws helped keep it playful instead of boring. Mmmmm...now I want a cookie. And what kind of party would it be without flowers? I have been mildly obsessed with white hydrangea this year. This bunch I bought at Trader Joe's lasted for two weeks! 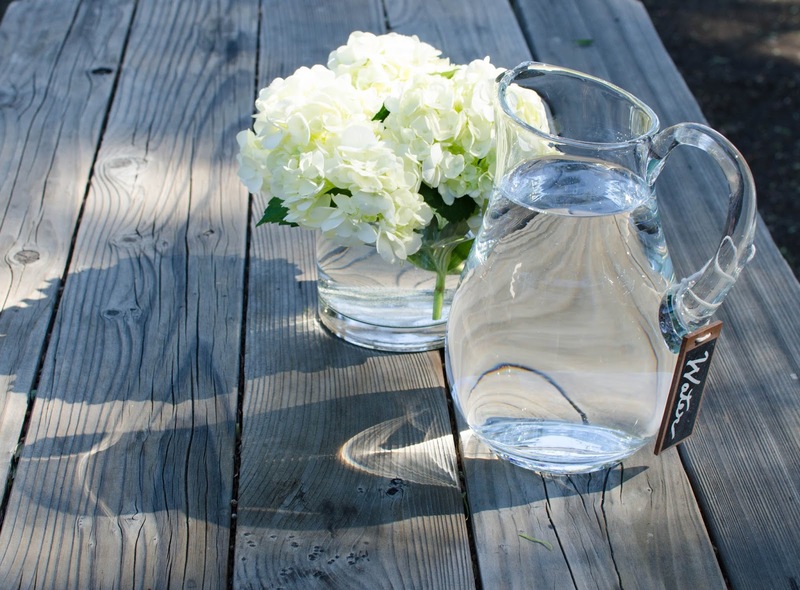 One large arrangement was the sole decoration on my (we'll call it rustic) picnic table. And a few smaller bunches were placed in mason jars on the Cookie Bar for an understated fancy. 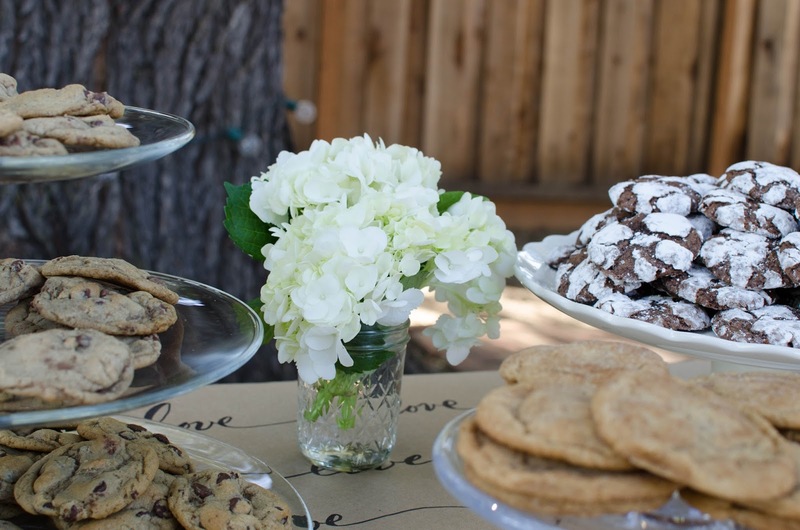 Despite my intense love of cookies, I did encourage the party guests to take a few home for the road. 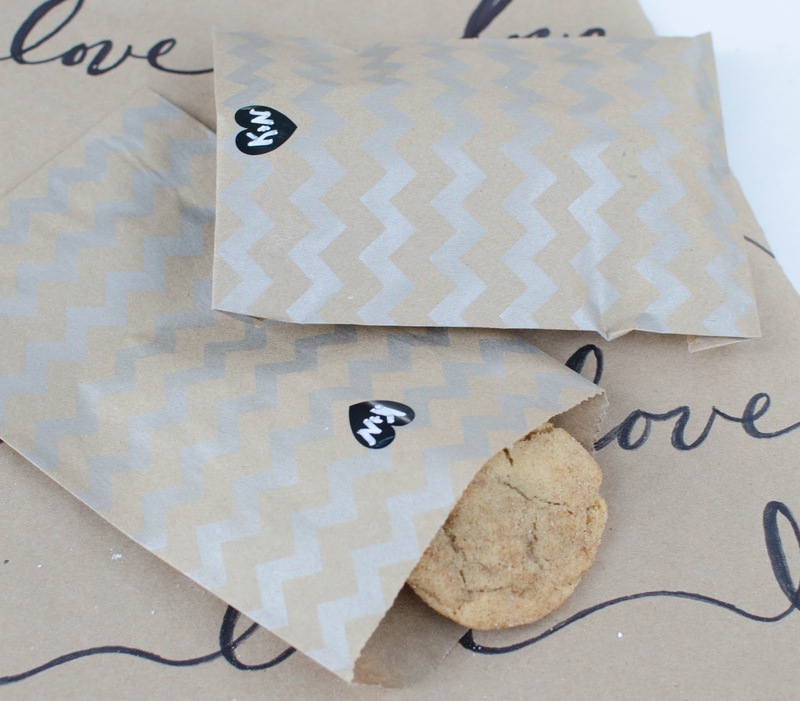 Kraft paper bags and black heart stickers (both from kraft&color on etsy) served as favor bags. 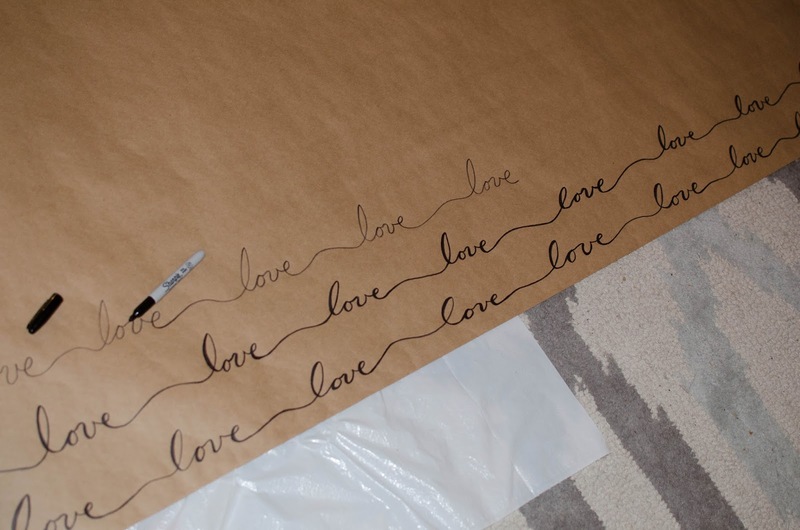 A chalk marker was used to add a 'K+N' or 'love' to the stickers. 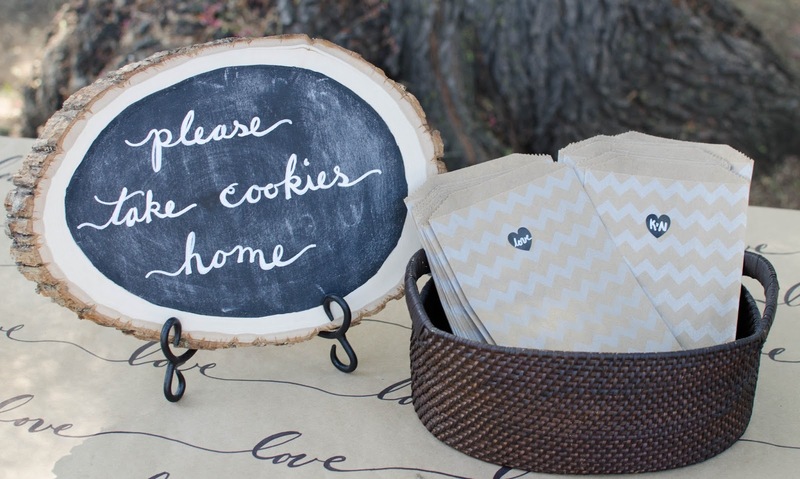 You can also find the DIY instructions here for the tree slice chalkboard. In an attempt to distract from the state of my drought-ridden California yard, I put a few clusters of balloons around the setting. Little did I know that the balloons would also serve as entertainment for the toddlers. Bonus! As always, what really makes a party successful is the people. There were no games, no activities, just mingling and eating cookies. A perfect example of what I have come to love most about throwing parties - providing a fun setting to celebrate life and enjoy each other's company. Of the approximately 50 guests, we had teeny babies, college students, grandparents, and everything in between. It was a beautiful picture of what it is like to live in a community in the true sense of the word, and gives me great encouragement that the newlyweds will be supported by people in all life stages. The paper pendant with the chalk letters is very cute! My mom told me once that if you want to keep chalk on paper (or contact paper, in my case), spray the paper with hairspray after you finish writing with chalk. It won't hold up to rain or water, but it'll hold the chalk in place while you are trying to transport or hang the banner. I'll be sure to mark these from your Pinterest page! Thanks, Jennifer! That is a great tip for a chalk banner. Your mom is a smart lady. I'll have to try that next time. This is an usual party to consider to be taken and enjoy! Thanks a lot for sharing your ideas with other people, blogging is necessary and essential! Our thesis writing services will increase traffic to your blog - rely on our professionalism!